“There [are] occasions, I [believe] when a nation was justified in using military force to achieve its ends, to stop a Hitler or some comparable evil” (Things They Carried, 44). Research papers on famous literary geniuses are common for the writers at Paper Masters. Whether it is an expert on the Vietnam war, such as O'Brien is, or one of the classical authors that are typically assigned in English courses, the writers at Paper Masters will outline their life and works for you in an easy to understand and replicate research paper. Clearly, O’Brien did not believe that the United States’ involvement in the Vietnam War was a vital necessity and although there were major demonstrations against it at the time, O’Brien appeared to be more content with subliminally resisting the concept rather than participating in any high profile rallies that might mark him as an obvious dissenter. That is until he received his draft notice in the mail, which brought the notion of fighting in a war that he did not believe in to the forefront of his consciousness and ultimately his every waking moment: “It was a kind of schizophrenia. A moral split. I couldn’t make up my mind. I feared the war yes, but I also feared exile” (44). It is this inner conflict, which O’Brien faces from the time he receives his draft notice, that sets the stage for the metaphorical intervention of a character that has all the attributes of the popularly embraced mystical legend – the angel. Elroy Berdahl - Custom American Literature research papers on Elroy Berdahl come from the novel The Things They Carried by Tim O'Brien. Tim O'Brien's "The Things They Carried" - Tim O'Brien's "The Things They Carried" Research Papers look at an example of how to order an annotated bibliography. In the Lake of the Woods - Research papers on Tim O'Brien note that he is one of the great storytellers of our time. How to Tell a True War Story - Custom research papers on How to Tell a True War Story from Things They Carried by Tim O'Brien. 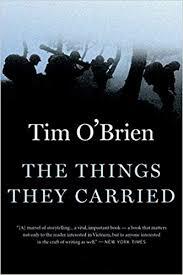 Paper Masters writes custom research papers on Tim O'Brien who is best known for his book "The Things They Carried".